The Zoo District lives up to its name with a vivid commedia del arte production of Steven Haworth's (h o m e), which melds genres from traveling circus to The Wizard of Oz to Mesopatamian history and Iraqui present-day politics into the moment of truth of one frazzled woman. The company asked the playwright to provide something about Gertrude Bell, Lawrence of Arabia, and Iraq that would swirl around their mandate of using various disciplines to create original works with substance and flair, and this is what he's come up with. Dora Tuttle (Bernadette Sullivan), traumatized by an unfaithful husband and infuriating daughter, dives into the world of the book she's reading, a biography of Gertrude Bell (1868-1926), the remarkable political strategist whose career ranged from British intelligence agent to personal advisor to Faisal, first king of Iraq. Sullivan plays both roles, assisted by deft on-stage costume changes from a mysterious Arab. As Bell, she has crisp dialogues with Lawrence of Arabia (Bjorn Johnson), snidely directed as a suave patter that would have made Noel Coward proud. As Dora, she travels to Mesopatamia in search of a legendary tablet bearing the secret of life. Weird characters who pop up from unlikely places to join her on this odyssey include Bartholemew Pew, an inventor and Humpty-Dumpty look-alike; dotty Professor Chadot, best-known for his Children's Guide to Grecian Urns; Scarlett Crow, an angry Asian girl; Al Qaadir, an Iraqui child whose arms were amputated by the enemy to make her parents confess. The play includes a torture scene in which the speechless anguish between Dora and the child is truly devastating. 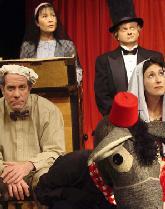 There are any wonderful dances by Brian Frette in a variety of roles (most memorably as a donkey whose tapping feet provide a rhythmic background for the travelers' dialogue), historically didactic scenes between Faisal, Gertrude and Lawrence and nonsense dialogue between the Professor and Pew in long swings that drop from the ceiling. Natural disasters that rescue the company are instigated by ingesting red tablets from Pew's bottle, a cunning metaphor for that big tablet at the end of the road. Madam Al Shirizi (Madeleine Dahm, substituting on opening night for Carol Katz) performs the function of The Wizard of Oz, granting everyone's wishes and sending Dora home with a willingness to accept her life. At two hours and forty minutes, the play could use some editing and many of the finer points are lost in the overwhelming kaleidoscope of this dream world. But production values, like a conjurer's magic, divert serious criticism. Co-directors Jon Kellam and Gleason Bauer get their dramatic money's worth out of every scene, the cast is excellent, Madeleine Dahm's movement direction is exciting and special praise goes to Bill Levine's music and sound design and Ronda Dynice Brooks' colorful and inventive costumes. Reviewed by Laura Hitchcock on.April 24.